Accoutrements is a company in California that loves to avoid boring products: "...we pride ourselves on being less disappointing than other companies." For Christmas, my kind brother gave me three of their toothpastes. 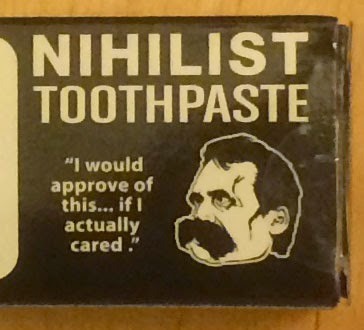 I was most amused by Nihilist toothpaste: "No Flavor • No Color • Nothing." It turns out, the paste does possess flavor - a slightly sweet flavor, provided by sorbitol. 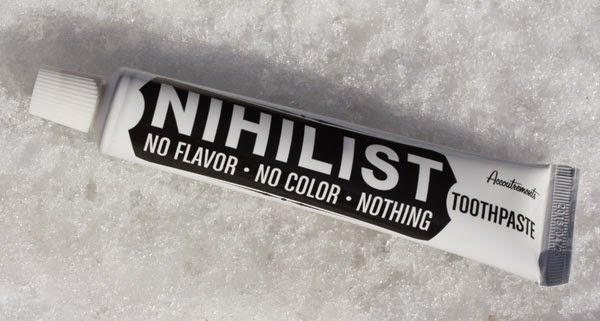 There is no color, if you follow the idea that white is the absence of color. Some say white is all colors combined. In any case, clear would have worked better for me to fulfill that characteristic. In keeping with the philosophy of many boutique toothpastes, there is no flouride. So "no tooth decay" might not be part of the deal. Stay tuned for more toothpastes by Accoutrements. This is one that I have seen and heard of. You have a fascinating blog. Thank you so much for sharing. Yes, well played. I don't visit often, but I'm fascinated by the collection and the descriptions of them, and appreciate your devotion. Thanks, Ander! Glad you found this museum. Zendium is a European toothpaste that promotes a healthy bacterial ecosystem in our bodies. Bacteria are both beneficial and detrimental to our health. If we live in an environment that is too sterile, our bodies cannot fight off the unhealthy bacteria. Some toothpastes apparently kill off both good and bad bacteria. But not Zendium (or at least that's the claim). The fascinating thing to me, an American, is that this bacterial-health toothpaste is made by a multinational company, Unilever. In the USA, such products would be sold by small independent companies that have really tiny budgets. 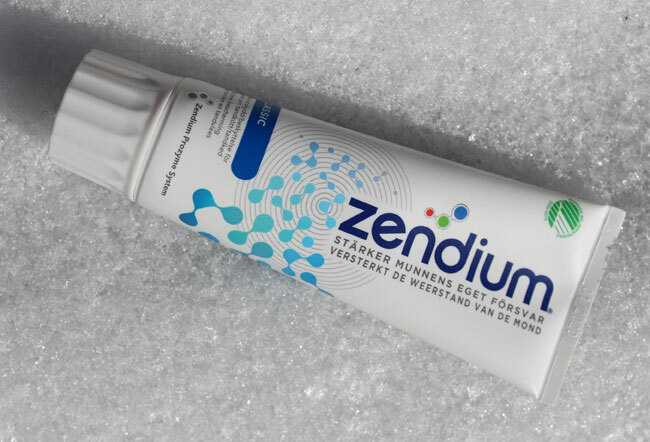 You can read more about the bacterial benefits of this toothpaste on the Zendium website (in German, but your browser should translate it for you). Translation: "extra-fresh pure". This has a very clean, almost astringent taste... think mouthwash. I like the aftertaste - it leaves my mouth feeling, as they say, extra fresh. Of course it falls into the minty category. The paste appears very similar to Aquafresh - but its taste is nothing like that! 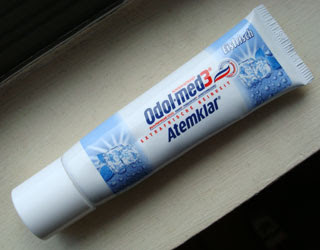 Odol-med3 is made in Germany and may not be available elsewhere. The glowing ice on the package might not be something you'd see in America; for some reason, ice and toothpaste are not a natural combination here. But I think that pairing is a good one. 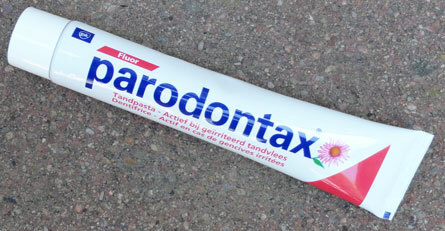 Parodontax is a lovely pink paste from England, by way of Belgium. It has become my new favorite paste. The salty flavor, similar to a baking soda paste, is refreshing without being sweet. (I get so sick of really sweet American toothpastes.) And I appreciate its flouride. The manufacturer's website states that it: "contains natural herbs such as rathania, chamomile, echinacea, mirra, mint and salvia." It's made by GlaxoSmithKline, a giant global pharmaceutical corporation. However, it's not a global brand for the mega corporation. The only place to get it in the US is from obscure importers like Smallflower. The package is completely in Dutch and French. The only English is "Parodontax is a registered trademark of the GlaxoSmithKline group of companies." Plaque is an important cause of irritated gums.